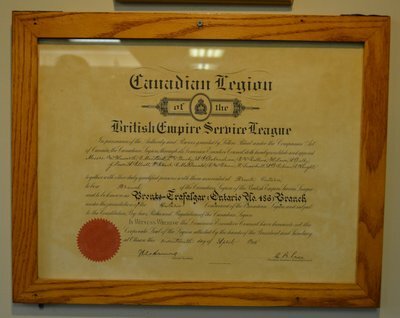 According to Legion member and Past President Gene Reed, there was no Bronte Legion when his father, Cliff Reed (also a Past President), came home from WWII. Cliff Reed initially joined the Oakville Legion, which was Branch 114 in downtown Oakville before it was moved to its current location on Upper Middle Road. Cliff Reed and around 12 to 15 other veterans from Bronte starting having meetings at each other’s homes. On April 17, 1948, this group of men formed the charter for the Royal Canadian Legion Branch 486. Meetings were held at the hall down by where the cenotaph is today, before Legion building was built. As the Bronte Legion grew, it became harder to communicate news about the Legion and its ongoing activities to all the members. 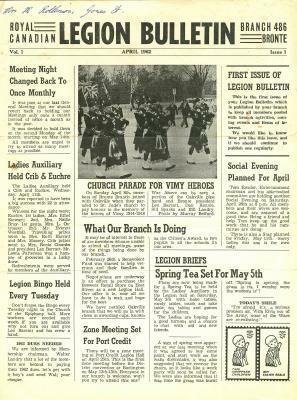 A branch newsletter was created in 1962, at first called the Legion Bulletin and then changed to the Bronte Bugle in 1968. 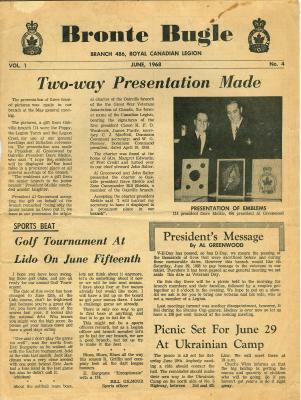 In April, 1962, the first issue of the Legion Bulletin newsletter was published by the branch to keep all members posted on branch activities, coming events, and items of interest. The Bronte Bugle newsletters included a message from the Legion President, reports from the Secretary and Treasurer, a section on Legion entertainment, a “Women’s Talk” section, and a Sports Beat column. There was also a section titled “The Last Post” for obituaries of members who passed away. By 1968, membership had grown to around 20 to 25 veterans and a Legion building needed to be built. Each member loaned Branch 486 a sum of $2500, which was used to build the structure that is used today. Each of the loans were repaid. 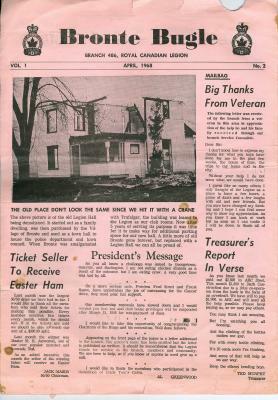 On the right is an issue of the Bronte Bugle from 1968 that features an image of the old Legion hall being demolished. On June 6, 1975, the Branch was renamed to R.C.L. General Chris Vokes Branch, in honour of Brigadier-General Chris Vokes. According to Past President Gene Reed, the executive took the decision to the membership and the members voted on changing the name. Most Legions today are named after ex-army Generals. Gene’s father, Cliff Reed, has served with Chris Vokes in Italy and Vokes had retired to Oakville after his service.